I've read Melissa Scott's science fiction since she hit the bookstores in the 80's. She managed complex and satisfying world building combined with characters that were both alien and easy to relate to. Jo Graham is not an author that I have encountered before but now I intend to check out her backlist. 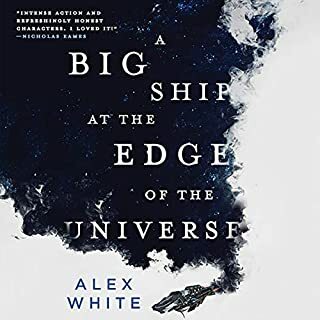 Anyway, when I saw this book listed on Audible I seized on it at once, and I am very happy I did. Not science fiction but historical fantasy, the background of the story is the final year of the 20's. The adventure starts with an archaeological dig in Italy. The archaeological dig is real enough, as are the ships built by Caligula and then sunk in the lake after his assassination. Add to this the release of an ancient malignant being with the attempt to recover the ships and there is the satisfying bones of a good story there. Alma, Jerry, and Mitchell are all members of a Hermetic Lodge. Jerry and Mitchell are combat veterans of the Great War. Alma was an ambulance driver and the widow of their friend and Magister, Gil, who died of the effects of mustard gas after the war. Each of them have lost something. Early in the book they are joined by Lewis Segura, another veteran pilot who becomes Alma's lover and employee as they struggle to come to terms with their losses and rebuild their lives, mundate and magical. This story feels true to the time. The details about flying and the attempt to commercialize add to the story. A good part of the US is covered from Colorado to Hollywood to Chicago with period detail highlighting, but not overwhelming the plot and characters. John Lee, the narrator does a great job. His general narration accent is American with a 1920's feel to it but he voices the characters with their various backgrounds well. Even when reading ritual magic he does not go overboard. There's another book in this series on the way: Steel Blues. I'm looking forward to the Audible version. I was thrilled to see a new Melissa Scott book out and ordered it immediately. I had a hard time getting through the story. The premise is good: a lodge of magicians in 1929 needs to stop an evil spirit. Historical detail seems okay and the story takes includes a lot of stuff about the old airplanes, which I have an interest in. The plot follows a decent arc to a tense confrontation and has enough action throughout the story to keep things moving. My problem is with the characters. There are four protagonists. The point of view switches between them, but there's little to differentiate the voices, let alone the characters. It's as if we have one person broken into separate pieces and whomever is convenient comes to the front. That makes the story flat. The narration is adequate, but to carry the book it needed to differentiate the characters more. That wasn't there. The narrator doesn't do accents well and there is no different pacing for the different voices. Also, he would at times get into repetitive lilts when the sentences were of equal lengths. I blame this more on the writing than the narrator. Still, it was at times an intrusion into the story. Join pilots Lewis, Alma, and Mitchell, and their archaeologist friend Jerry, on an extraordinary journey halfway across the globe to enter into a world of demons, a secret society, magicians, and archaeology. I believe that the factual bases were exquisitely researched and fed to the reader as a leisurely 11 course meal. The characters are real to their time, yet the reader can easily relate to their actions as well as their personal struggles. Well written, irregularly paced, engaging. A very enjoyable read. John Lee is an excellent storyteller. What made the experience of listening to Lost Things the most enjoyable? I love the storytelling quality of John Lee's narration. He has the perfect tone to carry a story forward and draw me in. Louis, because of all the challenges he faced, and the way he stepped up and overcame adversity. I love the big chase / fight on the airship. It's well written, and brings that very unique setting to brilliant life. Just enjoyed it thoroughly and looking forward to the next adventure for this crew. I kept zoning out with this book and having to back it up.It just seemed to drone on about mundane things when there was evil to vanquish,Etruscan to figure out,etc.I liked the narrator,John Lee,but he was not right for this book.Set in the 1920's,mostly,we come in when Jerry is asked to translate an ancient text that was found in a temple after the draining and archeological dig at Lake Nemi.There is a curse and a demon who inhabits people then jumps to someone else.Alma,Mitch,Jerry and Lewis live together,work together flying air ships and planes,and are members of an ancient hermitage that handles things like this. 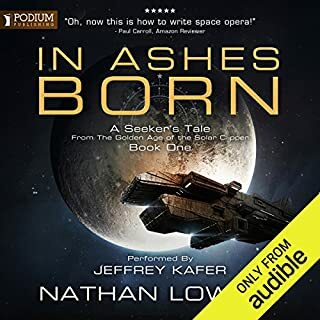 "I was provided this audiobook at no charge by the author, publisher and/or narrator in exchange for an unbiased review via AudiobookBlast or MalarHouse dot com"
This story was not what I expected. It was actually better than I expected. This audiobook is set in the year 1929. The war is over and many men who have returned to America are finding themselves at loose ends. In the war Lewis Segura was an exceptional pilot. Despite his stellar reputation he had a hard time finding a job after the war. Eventually he finds a home (in both work life and real life) with Alma Gilchrist who owns a small airline company. Alma's husband had died after returning from the war from the effects of mustard gas, leaving Alma as the owner of their airline. Meanwhile, in Italy, an archaeological dig is taking place at Lake Nemi. They have discovered two ships beneath the lake's waters that date back to the time of Caligula's reign. But the archaeologists do not just discover hidden artifacts. Something else was hidden with those ships; something evil, and now it has been unleashed. 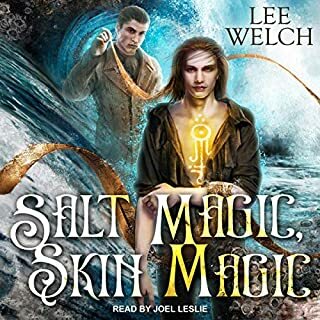 What Lewis, Alma and two friends could possibly have to do with ancient Roman artifacts you will have to listen to this audiobook to find out. 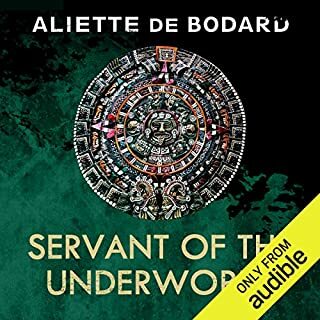 This audiobook is over eleven hours long, but the story is filled with twists and turns that will keep the listener interested the entire time. The narration is excellent. There are quite a few phrases in other languages that could easily have been tongue twisters, but John Lee voices them with ease. Also, he has the perfect voice for this alternate-history type of story. For some reason that I cannot explain, his voice lends the storyline credibility. I rate the narration as 5 out of 5 stars. 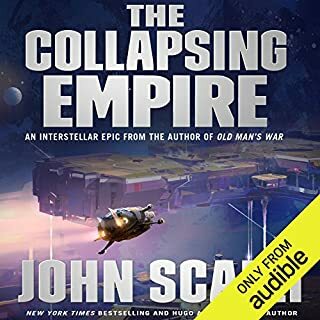 I enjoyed this audiobook and would not hesitate to recommend it to both "real" and alternate history lovers. What did you like best about Lost Things? What did you like least? As a reader with an interest in the early years of avation, especially the WWI period it was great to hear the descriptions on how the early craft handled and flew. The author seemed very well researched in this area. I didn't like how slow the story unfolded overall but that is a small complaint to be honest. Would you recommend Lost Things to your friends? Why or why not? 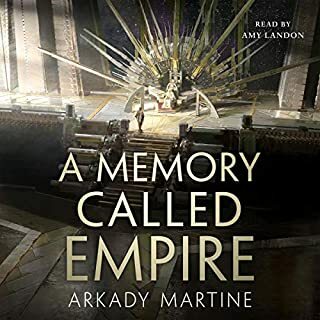 I would recommend it to fans of fantasy / military. It was an interesting steampunk take on things. Very believable characters mixed with a very well written fantast setting. If you are a fan of fantasy this is definitely a book to read. I liked the whole atmosphere around the magic lodge. Very subtlety written with a vibe of danger. Do you think Lost Things needs a follow-up book? Why or why not? Yes it definitely needs it, or should I say merits it, because it was a little slow but seemed to be laying the foundations to further story telling in the series. This was a promising book, the idea was good and the series could be good overall, but I think the book needed a little more substance and a little less binal discussions amongst the characters. Reading the blurb for this, I thought it would have more archeology in it. Listening to the first few chapters, I really had no idea where this was going. It starts in a little airfield, run by a widow and her dead husband’s friend. Seriously, what did that setting have to do with an archeological dig site? The more I listened, the more Lost Things felt like a cross between secret societies deeply intertwined with the supernatural and Indiana Jones. It has detailed descriptions of the art of flying in the early twentieth century, which was very interesting. Once out of the airfield and traveling to find ancient tablets, you get a deeper sense of what interpersonal relationships were like back then. You never fall into the trap of relating the characters and their actions with today’s standards. The paranormal aspect is so subtle as to fall a layer behind the setting and culture of the time. Characterization and the characters’ actions rises to prominence. John Lee does a very consistent and smooth job of narration. I’m not sure if it was the writing or the narration, but on occasion, the scene changes occurred to quickly and it took me a few sentences to catch up. Overall, a pretty decent listen. The story. Hands down the story carried this all the way through despite the narrators monotone voice and lack of any real emotion. The backdrop of the title. Taking the historical aspect of the 20's and the creation of a fantastical world to build around it. Who would you have cast as narrator instead of John Lee? Not sure, but someone with a little more excitement in the voice would have been nice. I had a very hard time keeping my ears on book. Absolutely nothing about his performance drew me in. This is a book in which the story itself carried it. There was nothing that was added by the narrator, and nothing that really drew me in. That can be good or bad I guess, but for me, when I hear an audiobook, I want emotion, I want something more than just the written word being read to me. It doesn't have to be fancy, just at least act like you care what's going on in the story. I will absolutely check out the other books, just in print format. I didn't enjoy the story enough to recommend it. What could Melissa Scott and Jo Graham have done to make this a more enjoyable book for you? They did a fine job given the material they had to work with. Ms. Scott's voice was somewhat subdued, which made the tale even less interesting. I didn't like any of them, actually. Did Lost Things inspire you to do anything? 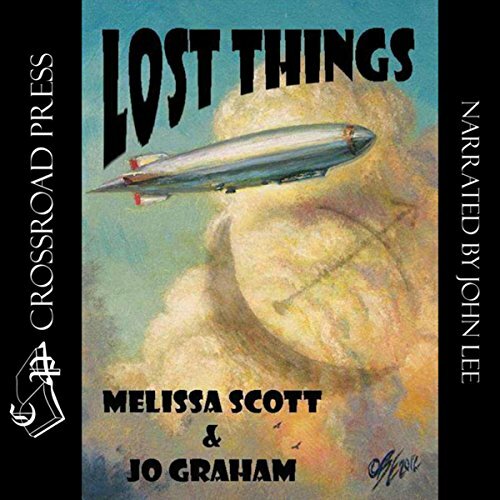 What did you like most about Lost Things? The way the story line developed. This book was provided free of charge in exchange for a review. The book started out as a typical WWI aviator who never got over the shock of war. But it seems that the story line develops in pieces with the discovery that the flyer has prophetic dreams that tend to come true. It then builds as it is revealed that there is a secret organization of people with various abilities that feel they should save the world. This book built up the story line very well and by the end of the book you were not sure the good guys were going to win or not. But it did a fantastic job of knitting all the parts together and was very enjoyable. Enough so that I am actually thinking about the next two books in the series. John Lee isn't the most dynamic narrator; but did a very good job on the various people's voices. I searched for Steampunk on Audible and this came up in the list. It isn't Steampunk at all, and I have no idea why it was in the list, but it does have magic in it. A liitle. All the main characters can do magic, and the whole story is about magic, it really isn't all that magical. It's a bit like a long winded chase with vaguely magic interludes. Think of a fairly dull version of North by North West, with no characters you like all that much. The narrator isn't bad but I kept losing track and found my attention wandering. No idea if that was him or the book not holding my attention. The point of view shifts all the time, and in the reading that feels really confusing at times, maybe it's clearer in the text.